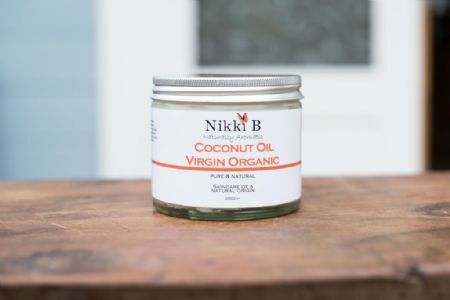 Organic coconut oil melts upon contact with the skin and is an excellent skin emollient. It deeply nourishes the skin, is easily absorbed and can also be used as massage oil for the body. Virgin coconut oil possesses high antioxidant properties and can be used widely in haircare and skincare soaking your skin in natural anti-ageing moisture and adding hydration to hair. A uniquely versatile oil. Apply to clean skin. Organic Coconut Oil is solid at room temperature and liquefies when warmed up. A little will go a long way so simply smooth a small amount of the oil into the palm of your hand and rub your hands together to gently warm up the oil. Massage the oil onto the skin, this will leave your skin feeling extra soft and nourished. Use a clean spatula to decant the desired amount of product into a disposable bowl for each application. Used as an all over body moisturiser it helps to reduce chronic skin dryness and aids the removal of the outer layer of dead skin cells. It also helps to increase the skin’s elasticity and promotes a smoother, more youthful looking complexion. It is suitable for all skin types, but is particularly useful for dry, flaky skin and conditions such as psoriasis, dermatitis, eczema. Coconut oil is also a great hair conditioner. Used as a pre-wash treatment up to half an hour prior to shampooing, it can be used to nourish and repair dry damaged hair and to treat dry and flaky scalp conditions such as dandruff. A pure vegetable oil obtained by mechanical pressing of the oil from the coconut palm Cocos nucifera. White to off white with a natural coconut aroma. 100% natural and cold pressed.